A co-founder of Mikiten Architecture, social justice has been Elisa’s guiding prinicipal. Early in her career, she authored a set of guidelines for making the oldest subway system in the country accessible to people with disabilities. She wrote a handbook for retrofitting a home to suit changing physical abilities, and a travel book for wheelchair riding people visiting Los Angeles beaches. As a designer, she has retrofitted many homes and apartments for people with disabilities, and 28 units of old navy housing for homeless veterans. She has also worked in affordable housing and helped start a successful non-profit development corporation here in Berkeley. Erick and Elisa still enjoy a late night charette, though Elisa has sworn off CAD and production work. (If ever the world returns to paper and pencil, she’ll be there.) 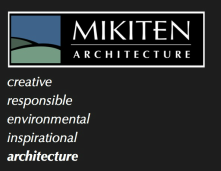 Meanwhile, she loves a job site and often handles Mikiten Architecture’s construction administration. Elisa sat on Berkeley’s Zoning Adjustments Board for over five years, and has deep insights into how to get projects done in Berkeley and other cities. When not at her desk, she can usually be found in the vegetable garden, or hiking with Gromit. She’s also known for her color consultation services all over town. — Master of City Planning, University of California at Berkeley.